Get ready to enjoy the best of everything at our luxury hotel in Windermere – from the design of the suite in which you are staying and the in-room touches, to the room service and breakfast menus prepared by our talented team. Whether you are planning a romantic weekend away, celebrating a special occasion or anniversary, searching for the perfect honeymoon or babymoon destination, or just looking for luxury accommodation in the heart of the Lake District, we can help you plan all the little details to make your stay at our boutique hotel in Windermere – perfect. We look forward to meeting you, however you choose to spend your time with us. The Lake District is unashamedly good looking. The combination of rolling hills backed by dramatic mountains and fronted by still, clear waters is a winner whatever the season or the weather. It’s a place that inspires an emotional response, delivering a wow factor even on the gloomiest of days. 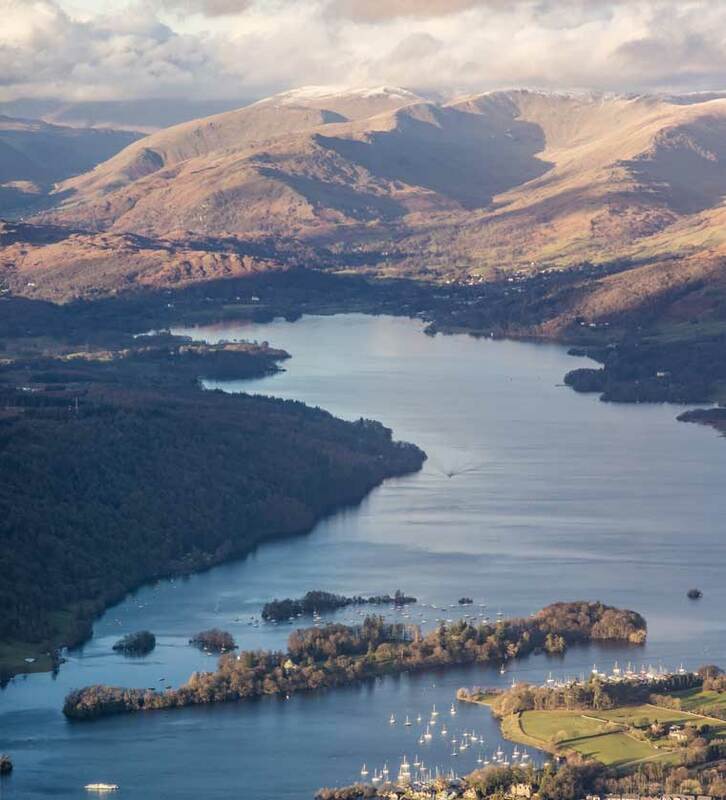 And you don’t have to walk far from our boutique hotel before you’re fully immersed in our world-class landscape – Orrest Head, an easy uphill wander of a few hundred feet, presents a panoramic view over Lake Windermere and the surrounding fells that will take your breath away. Bleached out, shadowy and misty, or vibrant, distinctive and sunny, you’re certain to fall in love with our landscape. Our traditional Lakeland exterior hides a suave and sophisticated interior. Our luxury boutique hotel has eight spacious suites (three with patios, two with private entrances) combine a sultry monochromatic finish with sleek hardwood floors or toe-sinking lush carpets, statement chandeliers, baroque-style beds, glass tables and velvet throws. Even the bathrooms are seductive affairs with huge air-baths for two, mood lighting and wall TVs. Underfloor heating, cuddly robes, and soft towels take the edge off the cool finish – with endless hot water and delicious toiletries too, you may choose to linger a little longer. Delve into the tastes of the Lake District. Room service while you relax, bistros on our doorstep, and a choice of great dining spots within walking distance. There’s no shortage of options for food and drink during your stay and our friendly staff will be happy to make both recommendations and reservations. Breakfast is a lazy but satisfying affair. From croissants, porridge and granola to eggs Benedict, cold meat platters and a full-cooked, it’s brought to you, in your room, when you request it. The Windermere Suites boutique hotel sits on the main road down to the lake, on the edge of the vibrant village of Windermere (5 minute walk). It’s a relaxed, downhill stroll to Bowness (20 minute walk), which is incredibly popular with tourists due to the easy access to the lakeside and its gorgeous scenery. A big plus is that Windermere railway station is only 10 minutes up the road from here, although we also have private parking to the rear of the property for guests arriving by car. ‘True love stories never have endings’. The romance of the Lake District is undeniable. The romance of our suites is undeniable. It’s a heady mix of one of the most emotive landscapes in the world and luxury accommodation designed for extraordinary days and nights. Everything is designed for two – the enormous bed, the huge jacuzzi bath, the table for two, the sumptuous sofa, the bookable extras (bottles of champagne, delicious chocolates, rose petals and fairy lights, cheeky games and toys). Romance really is what we do best and you won’t want your stay to end. "We just returned from a one night stay in the Bowness Suite and it was absolutely beautiful. The service and attentiveness of Vicky the owner was second to none. We were greeted with such a lovely welcome and asked to sit on a sofa in a beautiful room whilst Vicky told us about the hotel and our suite, and recommended nearby restaurants for us. The suite itself was beautiful with everything you could ask for. The bath was out of this world with a bathroom TV which was fantastic! The shower was equally brilliant along with the amazing lighting in the bathroom. The bed was huge and exceptionally comfy. We had breakfast in our suite which was delivered through the secret hatch so no one even had to come in to our room. Breakfast itself was excellent and there was a great choice beforehand. The walk in wardrobe was a great addition with a well-stocked minbar that was reasonably priced. The Bowness Suite had its own private entrance at the rear of the hotel with a patio, so we didn't even have to walk through the hotel itself to get to our room which was great. An exceptional hotel." "I can honestly say it is one of the best hotels I have ever stayed in. Upon arrival our bags were taken and we were shown to our room, which had everything you would want and more. The staff were excellent, rooms were of a good size (we stayed in the Patterdale suite), the hotel in general was impeccably decorated and cleaned to the highest of standards. The room itself was spacious, had plenty of room in the cloakroom to leave our walking gear and suitcases. The bathroom, with its walk in shower and double jacuzzi bath with tv and mood lighting was just what a romantic getaway needed. Location wise it is a stone’s throw away from Windermere village so there are a few pubs and places to eat to choose from. The staff at the hotel are extremely helpful and polite, and were very good at ensuring they answered all questions you may have upon arrival." "Boutique hotels near me - We booked the Ambleside suite for our 1st anniversary and were not disappointed. We arrived ahead of check-in time and were shown to our suite straight away. The room was set out beautifully, with fairy lights twinkling on the headboard, rose petals on the bed and some luxury chocolates for us to enjoy. The bathroom was equally prepared with the mood lighting on to create a lovely atmosphere. Both rooms were spotless and the decor was flawless. Quirky features like your own entrance (space for the car directly opposite) and the food hatch for room service made this very much an ideal break for couples who wish to get away from everything and everyone. Also the walk in wardrobe complete with mini bar was a great addition so all our luggage could be stored away from sight and there was plenty of room for laying out clothes/getting dressed/making tea etc. The patio area was just lovely for chilling in the sunshine with a glass of fizz too!" "Stayed for one night in the Cartmel suite. Very good first impressions - looks very smart from the outside, and we were greeted by a friendly lady on arrival who offered us drinks while we were checking in and to take our luggage upstairs for us. Room was spotless and warm for our arrival - definite feeling of luxury throughout our stay. The bathroom was without a doubt the best part. The colour changing lighting of the mirror, shower and bath were such a nice touch and the underfloor heating was awesome. Towels and bathrobes were lovely and soft and clean. The bath products provided were nice and we left with very soft hair after using the shampoo! The bed was ridiculously large and comfy, we had such a good night’s sleep! Liked the fact you could turn all the various lamps off with one light switch by the side of the bed. The complimentary tea and hot chocolate were pleasant, with pretty interesting looking cups and saucers. We didn’t touch the mini bar, but it was well stocked. You're given a pretty decent choice on arrival of what you want for breakfast the next day - Full English, veggie options, even choices of toast, cereal and cold and hot drinks to go with it. It arrived at the time we selected at our room exactly on time, lovely and warm. Location is brilliant, pretty central in Windermere, really easy to find and a nice easy walk to the lake and the centre. We were emailed a good list of restaurants in the area for dinner, and also given a map on arrival. The room was really quiet, no noise from any other rooms and we had the French doors open the following morning and there was next to no outdoor noise, which was lovely. "